Sue wants some more Photo Albums! Nicolle meets her twin sister! ​Tasmania. The Island under the Land Down-Under. ​Come all you jolly grey nomads, a warning take from me. When you are out on the road me boys, keep well away from Melbourne Quay. They'll load you on "Spirit of Tasmania", and take you across the Bass Strait. And the very next thing you know me boys, you've landed in Van Diemen's Land. A short drive mainly along a motorway took us to the outskirts of Melbourne from where a busy, narrow road led us to our campsite. Tomorrow our ferry to Tasmania leaves early in the morning and we wanted to be as close to the terminal as possible. As a campsite it is not good value for money and we still have the centre of the city to negotiate. A 5am start this morning as we had to get across Melbourne to the ferry terminal ready for the ferry to Tasmania. Despite the ferry not due to sail until 9am we had to be at the terminal by 6.30am. Navigating through the centre of Melbourne was not easy especially as it was still dark. All went well to begin with, thanks to a helpful member of the campsite staff who marked the easiest route on a map for us, but then we got to a one way street and couldn't go straight on as we were meant to. At that point we got hopelessly lost. We resorted to the sat-nav which, true to form, took us right through the very centre of the now awakening (and starting to get busy) city. Eventually we spotted four motorhomes ahead and decided to follow them in the hope that they were heading for the ferry terminal - luckily they were. 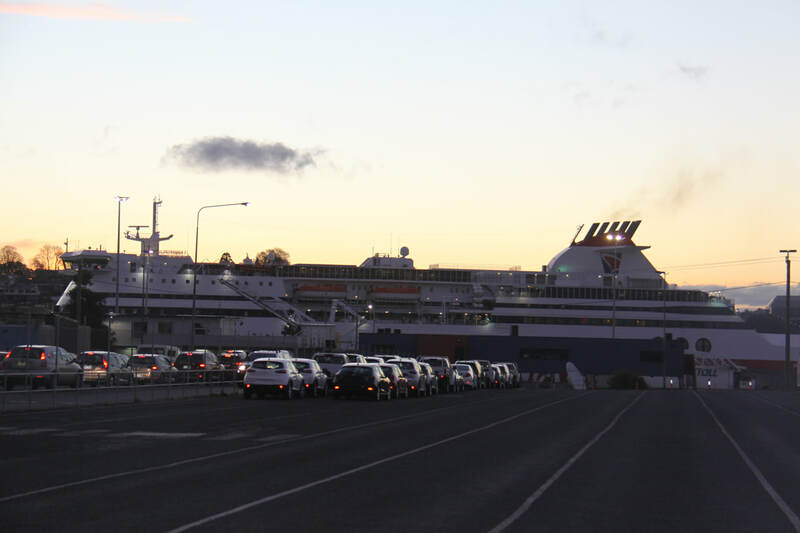 The "Spirit of Tasmania" was about the same size as our cross channel ferries but took far longer to load. Due to very windy weather a tug helped her out onto the choppy waters of Port Phillip Bay. Once through the very narrow heads it was immediately noticeable that we were now into the Bass Strait and it was no misjudgment by early sailors that they named the winds the "Roaring Forties"! As the ten hour crossing progressed it became rougher and rougher. We tried to go to the cafe for lunch but quickly realised that carrying a tray of food was an impossibility as we were having difficulty just staying on our feet. Lunch ended up being a pack of sandwiches and a bag of crisps! Inevitably the boat was late reaching Devonport but the campsite we had booked into was close by and well organised for late arrivals. A long day but at least now we were ready to explore Tasmania. After a good night's sleep we awoke to a bright but still breezy day. We headed into Devonport to do a food shop. Tasmania has strict quarantine regulations so we couldn't bring any fruit or vegetables into the state. We headed west following the north coast, heavy seas were crashing onto a rugged shoreline, before veering inland through lush pastureland with herds of dairy cattle. These eventually petered out and we drove through the middle of a rainforest before heading back to the coast and the tiny cluster of houses that is Arthur River. Here, a one track narrow wooden bridge crosses the river to reach Gardiner's Point - "The Edge of the World" - on the south side of the river. Travelling west from here the next landfall is South America. As it was still very windy today, the waves were crashing onto the low headland to the extent that white spumes covered the small coves and huge tree trunks were pushed up onto the beach. It truly felt like the end of the world on a day like today. South of here, the road is called "The Road to Nowhere" because of its remoteness and lack of settlement. Tonight we stopped at a camping area in Marrawah, a tiny hamlet above a bay. The view from Nicolle was across a beautiful windswept coast and out to the angry sea - just stunning. Weatherwise, where we had stayed last night really did feel like the edge of the world. 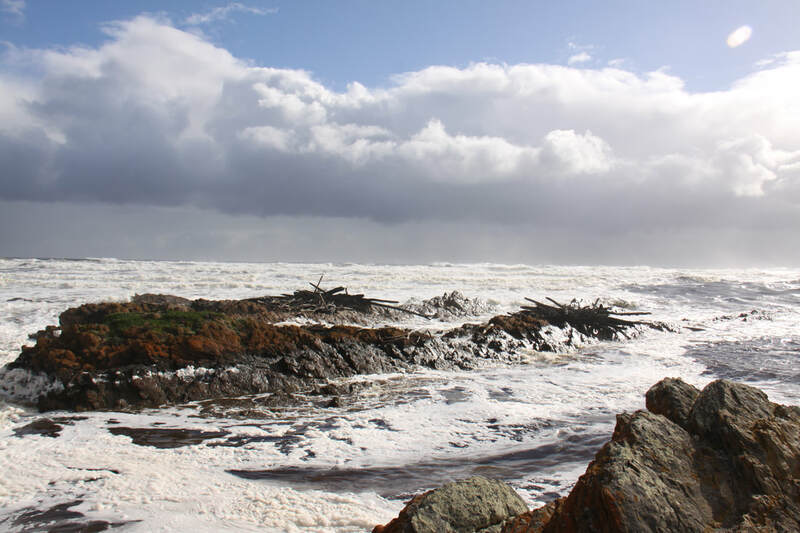 Lashing rain and fierce gusts of wind where whipping the bay's waters into a frenzy. At least we were warm and comfy tucked up in bed. This morning we had to re-trace our steps back along the coast as heading south from here was only a dirt road and was not suitable for a 2WD vehicle like Nicolle, even with her high ground clearance. Before heading south we visited the small coastal town of Stanley which is reputed to be Tasmania's prettiest seaside resort. Even in the rain the town's position at the foot of an ancient volcano, known as the Nut, was imposing. It was a pity that it was far too wet for us to explore its historic streetscape. We settled for a drive round the streets, viewing the lovely old buildings through sweeps of the windscreen wipers! None of the shops, cafes and restaurants, not even the tourist information centre, were open. There was one passenger in the cable car heading up the Nut, but we doubted whether they would actually see anything. At Wynyard, a little further along the coast, we stopped by the harbour and enjoyed the "pensioner's special" fish and chip lunch. On leaving the coast we headed inland to join the route known as the Wilderness Way. The rolling pastures full of cows and sheep, which reminded us so much of the lower slopes of the Yorkshire Dales, were soon replaced by temperate primeval rain forest. Tall trees and huge ferns pressed close to the road edge as we headed ever upwards with the outside temperature dropping rapidly. Despite the rain it was a stunning drive on virtually empty roads. We stopped for the night at the rest area in Rosebery, a small town nestling under the peak of Mount Murchison, a rough parking area with no facilities. Last night's raging sea was replaced tonight by a raging torrent of a mountain stream, rushing down in a deep gully to the side is! We woke to a dry morning but the clouds were heavy and there was no sunshine. We headed west back towards the coast, passing several large mines and quarries. Many logging trucks passed us and we noticed that large areas of the forest had been cleared. Further along the road we passed through beautiful rainforest and eventually reached the small coastal settlement of Strahan. 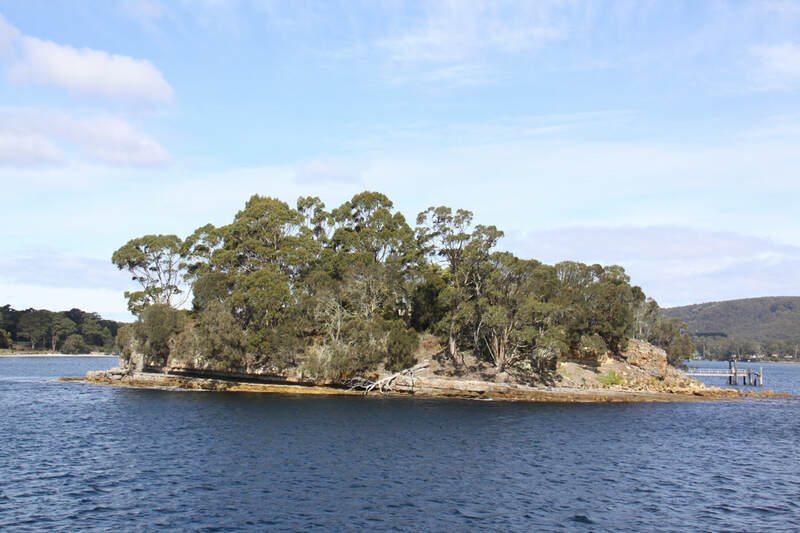 Total wilderness surrounds the town which is set on Macquarie Harbour, a sheltered body of water larger in size than Sydney Harbour. Unfortunately it started to rain heavily with thunder and lightning thrown in. We visited the Tourist Information Office where we were informed that heavy rain was forecast for their area for the next few days. However, it was due to be sunny for the next two days at least over on the east coast of Tasmania so, without further ado, we headed in that direction. It was a long day's drive but the magnificent scenery made up for it. The rain had left everywhere dripping and small waterfalls were gushing onto the side of the road, just the conditions you would expect on a rainforest. We passed through Queenstown, a place like no other we had ever seen. Originally a goldmining town, it is surrounded by an almost "lunar landscape" of red brown rock on which nothing grows. Tree felling, fire and acid rain have left a totally barren mountain which is not expected to recover for at least four hundred years. Not long after leaving the desolation of the area around Queenstown, we entered the UNESCO listed Franklin-Gordon Wild Rivers National Park, an area of pristine natural wilderness. As we climbed higher up the mountain we came across remains of snow lying on the side of the road. We then came across a number of reservoirs with huge pipes carrying water to the valleys where there were hydroelectric power plants. It had certainly been a drive of many contrasts. Our overnight camping spot was overlooking another man made lake, one of many that are dotted over this region. We woke early to a much brighter day - still a bit cloudy but for once, a blue sky. This spurred us to get up and off quickly so that we could make the most of the day. To begin with we passed through gently rolling pastureland populated by the usual sheep and cattle.settlements were small and we only passed through one town. However, as we got nearer to Hobart, the roads got busier and industrial plants started to appear. Interestingly, we passed vineyards and cherry orchards. 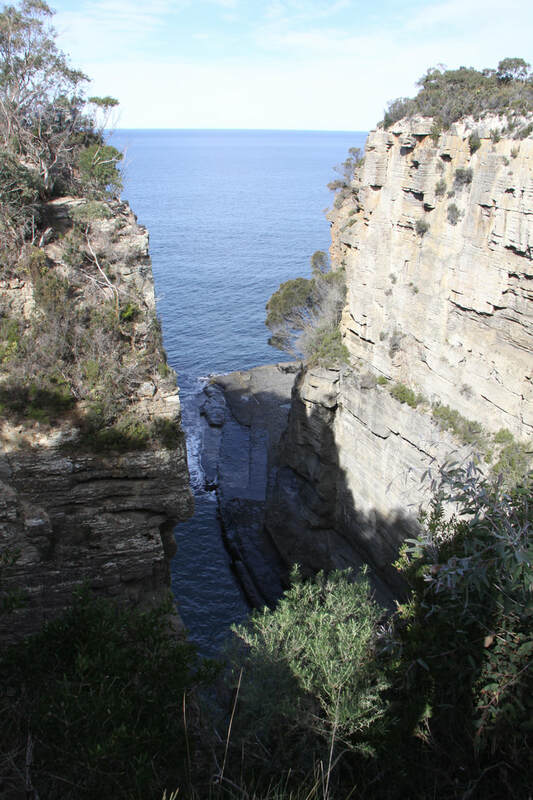 We skirted round Hobart to head to the Tasman Peninsula, which is reached by a narrow strip of land barely 75 metres wide at Eaglehawk Neck. It was here that during the convict era, a line of dogs were placed to prevent escaping convicts. These guard dogs were even placed on platforms in the sea! Of the original military garrison, only the Officer's Quarters, dating from 1832, remain. 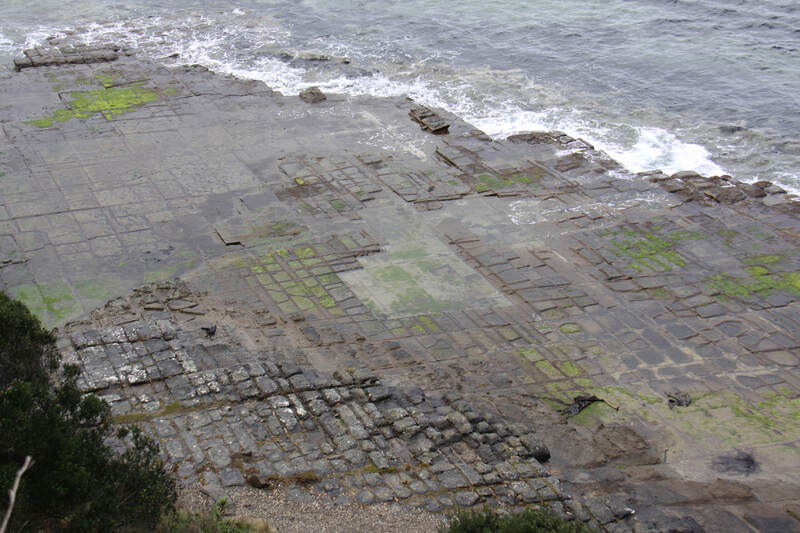 Just north of Eaglehawk Neck we also visited the Tessellated Pavement which is exposed at low tide. The rocky foreshore looks like a patio paved with paving slabs but is completely natural. From this point we began our journey along the Convict Traill with a visit to the UNESCO listed Coal Mine Historic Site. 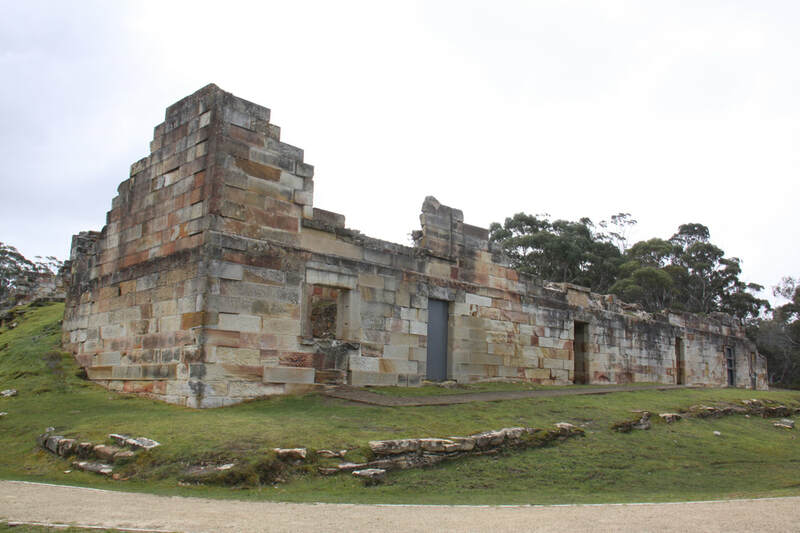 The mine opened three years after the opening of the penal colony at Port Arthur and was used as a punishment station for convicts that had committed serious offences in the colony. Only convicts who had been miners before transportation were allowed to work at the coal face. It is an eerie, isolated place and, as we wandered through just a small part of the extensive site, we couldn't help but wonder how those men, women and children had coped and survived. 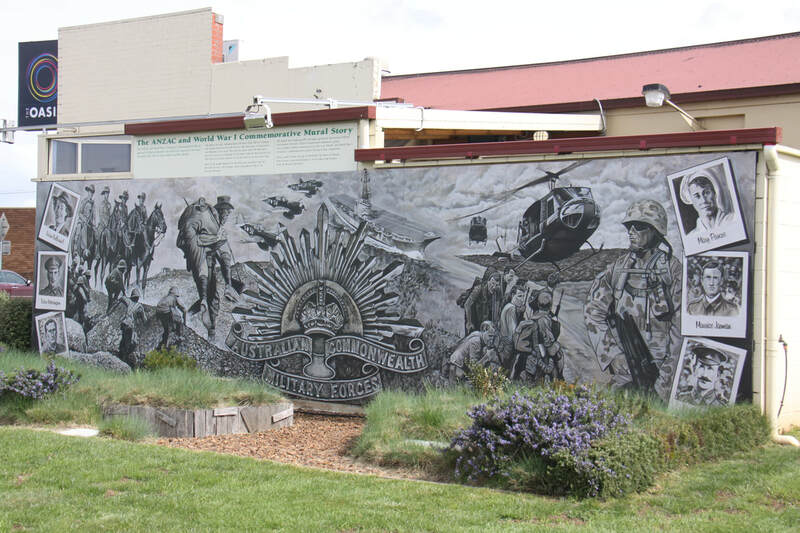 We camped for the night at the Tasman Ex-Servicemen and Women's Club in Nubeena. We were made to feel very welcome. The $20 overnight charge included a $10 drinks voucher which could be used over the bar. 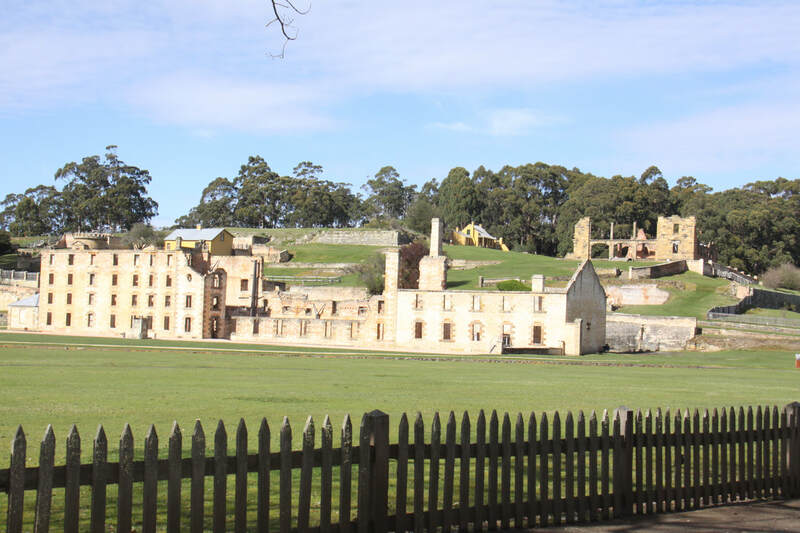 The whole of today was spent at the UNESCO listed Port Arthur Historic Site. We arrived at opening time and left when it closed an hour or so before dusk - by then we were exhausted. It was a large site and we had done a lot of walking with only a short break for lunch, in the café situated in part of what had been the Lunatic Asylum! The cost of entry was very reasonable and, despite being overseas visitors, on production of proof of age, we were given concessionary rates. All site entry passes were valid for two consecutive days and included an introductory tour and a harbour cruise. Other tours were available at an additional cost. 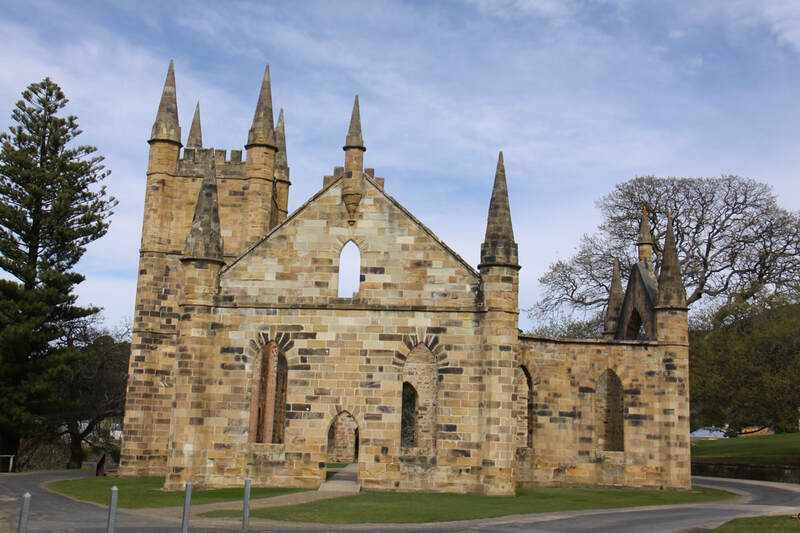 The introductory tour was excellent and gave us a very clear overview of why and how Port Arthur had developed. 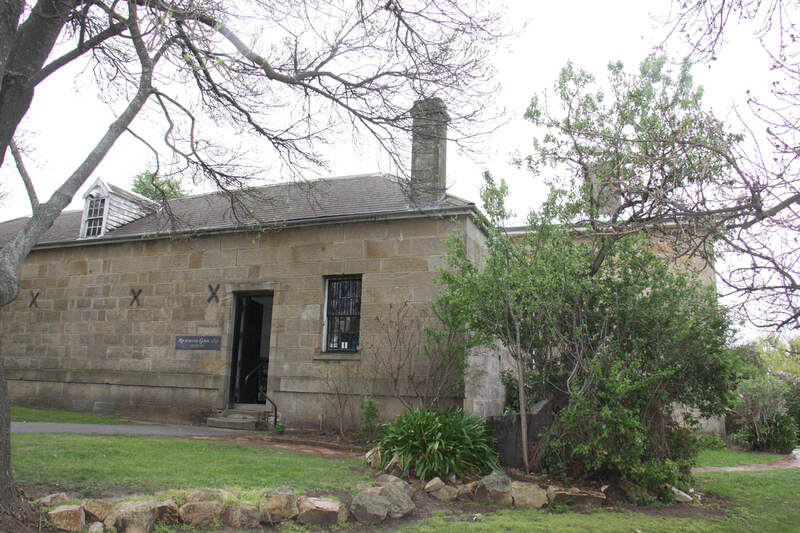 Open in 1830 as a penal station, where convict labour was used to fell timber, it soon became a punishment station for repeat offenders from throughout the Australian colonies. Its regime was modelled on Pentonville Prison in London where, supposedly, "rogues were ground into honest men". Followed the introductory tour, we set off to explore the complex. 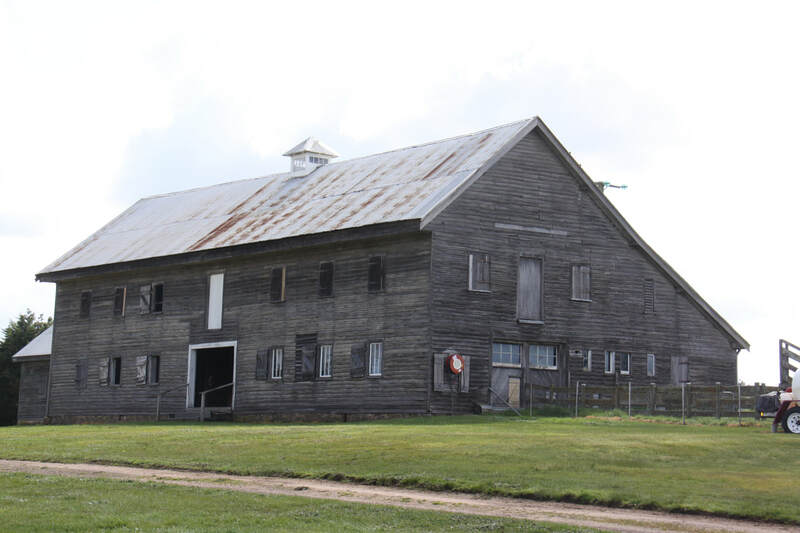 Many of the buildings are merely shells due to the devastating forest fires that tore through the site in the late 1890s. The site falls naturally into a number of areas so was easy to explore. Outside each building was an information board and dotted around the site were boards giving details of individual convicts who had served time here. By the time we had explored the penitentiary, the Commandant's House, the administration area, the military buildings, the welfare area, the asylum and the separate "silent" prison with its individual cells and the coffin-like standing-only stalls in the prison chapel, we were exhausted. Tonight we returned to the camping area at Nubeena. On Thursday evenings meals are served and what a delicious meal it was. We went to bed very tired and exceedingly full tonight! This morning we returned to the Port Arthur complex to complete our exploration of the site and to go on a guided "escape" tour. We wandered through the Civil Officer's Row where picturesque, fully restored houses were the former homes of the visiting magistrate, the Roman Catholic Chaplain and the junior medical officer amongst others. Set well back from the "working" area of the colony, and on a hill overlooking it, they must have been a harsh reminder to the convicts of what life could be like. On the slopes below these house, a landscaped garden, complete with pool and fountain, provided a calm place for the officers and their wives and families to walk and socialise. A non-denominational church, now just a burnt out shell following the forest fires, has views across the whole site to the Commandant's House and now ruined hospital above the harbour. Our "escape" tour was very entertaining. Our guide took us to the various locations where prisoners had attempted to "leave" the colony before having been granted their ticket of leave. 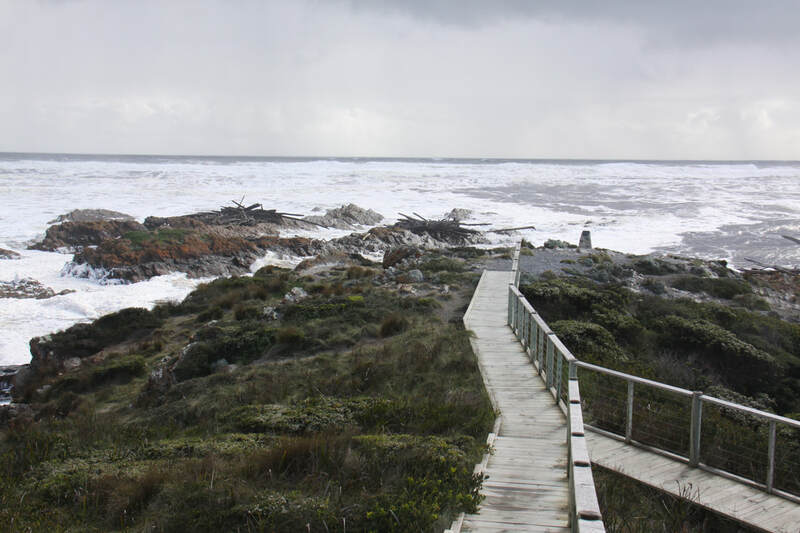 Few escapes were successful due to the location of the colony - thick, impenetrable bush and cold, exposed sea with no landfall until Antarctica. Still they tried, and the ingenuity and audacity of the attempts were amazing and often amusing. 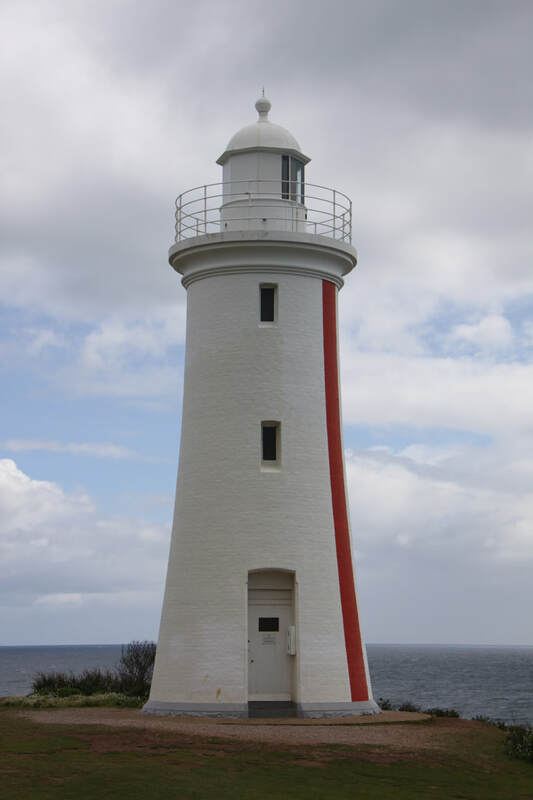 One convict dressed in a kangaroo skin and hopped out, another group stole the Commandant's boat and rowed across the Bass Strait, eventually being caught four months later. Despite 100 lashes and solitary confinement as punishment the same offenders kept trying. ​By lunchtime we were ready to move on back towards Hobart. En route we visited the huge Tasman Arch and the Devil's Kitchen, where the sea roars into sheer clefts in the rock face. In the nearby tiny village of Doo Town, all the houses have "Doo" names - "
Love-Me-Doo", "Doo-N-Time", "Didgeridoo-Doo", "Doo-Nothing" etc. The kiosk by the beach, serving fish and chips, burgers and icecream was called "Doo-Lishus". The icecream was! Tonight was spent in a camping field just outside the village of Dunallay. This morning we headed back to Hobart where we continued our journey along the Convict Trail. On the southern outskirts of the city are what remains of the most significant site where female prisoners were held. Between 1788 and 1853 some 25,000 women, some not much more than children, were transported to Australia. Three of the yards that formed the original prison now remain, but only one building - the Matron's Quarters. Low walls mark the positions of other buildings and each yard is surrounded by high walls constructed from large rectangular blocks. Dotted around the yard were small information panels, each providing details of an inmate, their crime, length of sentence and the name of the ship that brought them to Tasmania. Tonight was spent on a RV park at Sorell, which is one of Tasmania's oldest towns having been established in 1808. 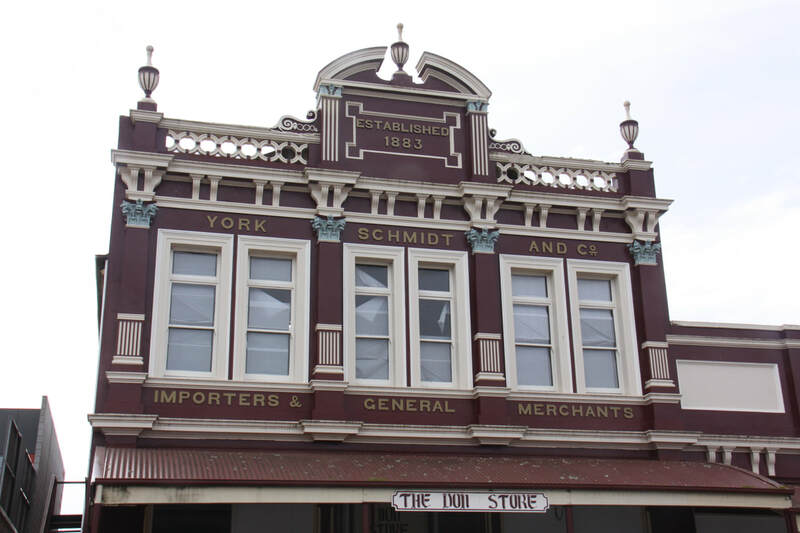 A short drive from the well-appointed RV park at Sorell, took us to the heritage town of Richmond. 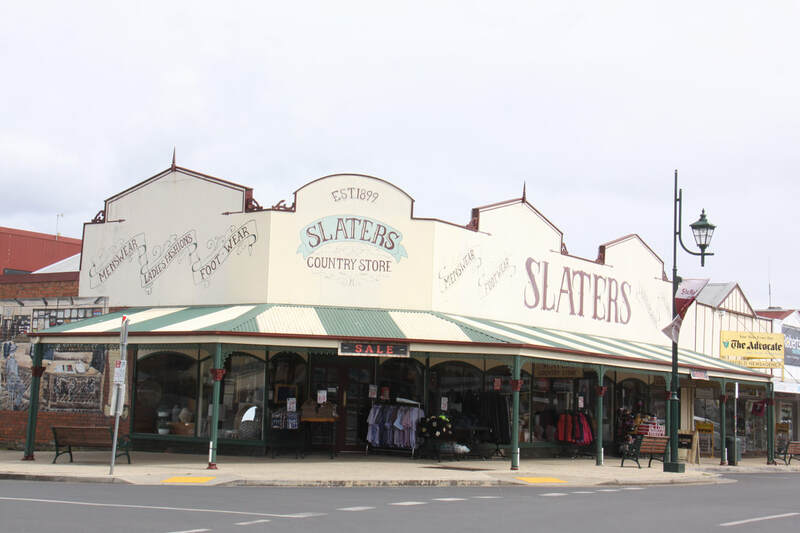 Situated on both sides of the Coal River, the town, founded in the 1820s, was once a military post and convict station on the road to Port Arthur. 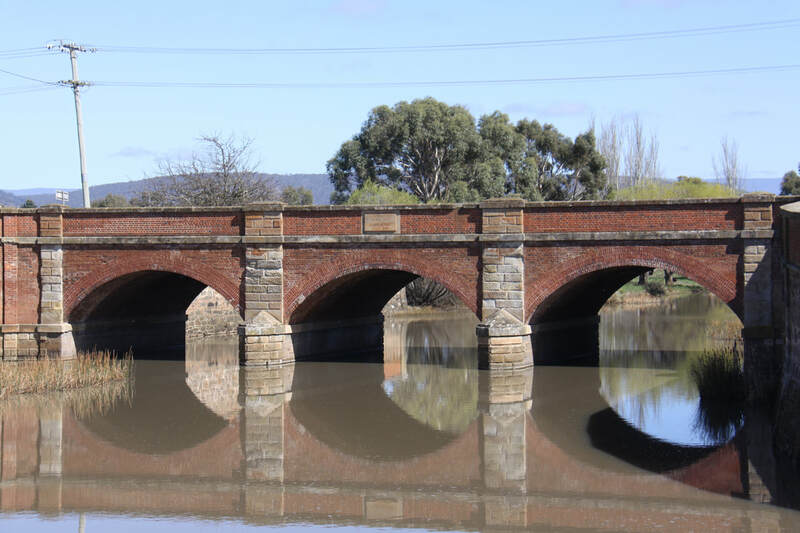 Its historic bridge over the river was constructed in 1823, making it Australia's oldest bridge still in use. Like many of the early buildings in the town, it was built using convict labour. Dodging showers we strolled round the pretty town where a real mix of building materials has been used. Most of the houses date back to the 1830s and 1840s. 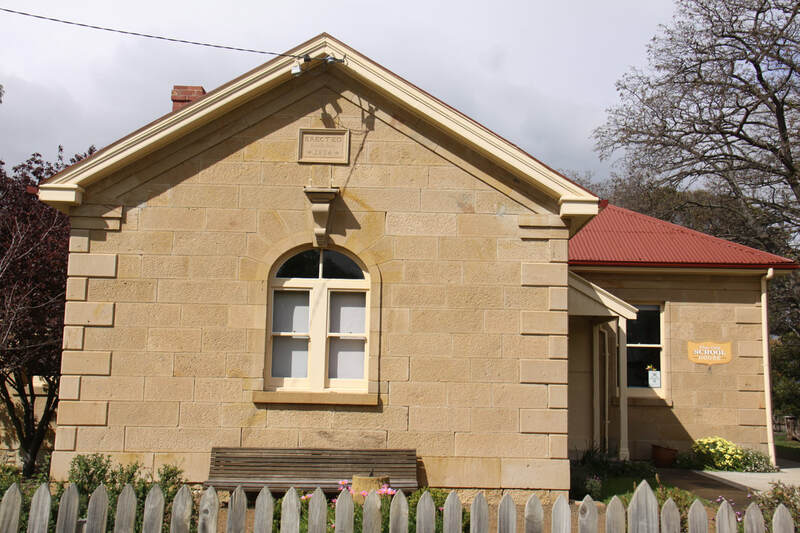 The Old School House was built in 1834 and is still used today, making it Australia's oldest state school still in use. Richmond 's gaol was even older, having been open for business since 1825 and was in use until 1828. 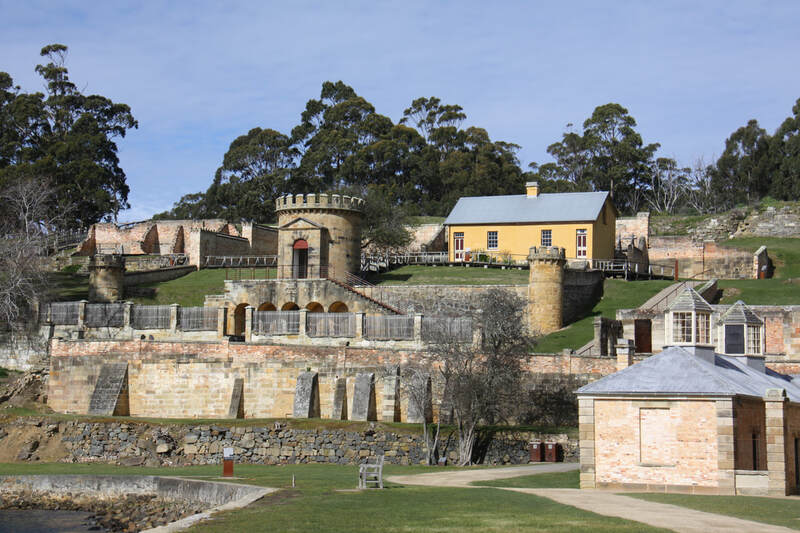 It is Australia's oldest intact example of an early prison. 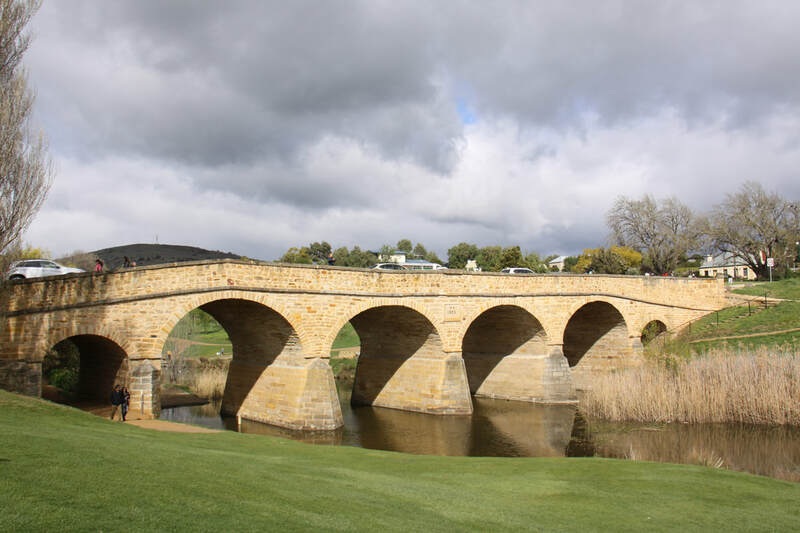 ​From Richmond we headed north through rich arable and agricultural land to reach the Midland Highway which links Hobart with Launceston. We stopped at Oatlands, another convict town with a number of fine sandstone Georgian buildings. However, the town's main attraction is the restored Callington Mill. It dates from 1821 and is the only traditional European style wind-powered mill in the Southern Hemisphere. Our overnight was on the RV section of the mill's visitor centre. After a very cold night - sub zero outside and not much warmer inside - we were quick to get going this morning. Our route following the Heritage Highway, took us first to the tiny settlement of Ross. Elm trees line the approach from the north whilst entering the town from the south you cross the bridge which, on close inspection, has elaborate carvings of Celtic symbols, colonial characters, animals and flora on its three arches. The convict stone masons who did the carvings were given their pardons because of their excellent work.The town itself is totally unspoiled - even the fuel station seems to be a relic from a by-gone age. Just ten kilometres further north is Campbell Town. Again it is a charming old town but, unlike sleepy Ross, the busy main road between Hobart and Launceston passes straight along its main street. Just north of the elegant red brick bridge, stand three impressive chainsaw carved tree trunks. 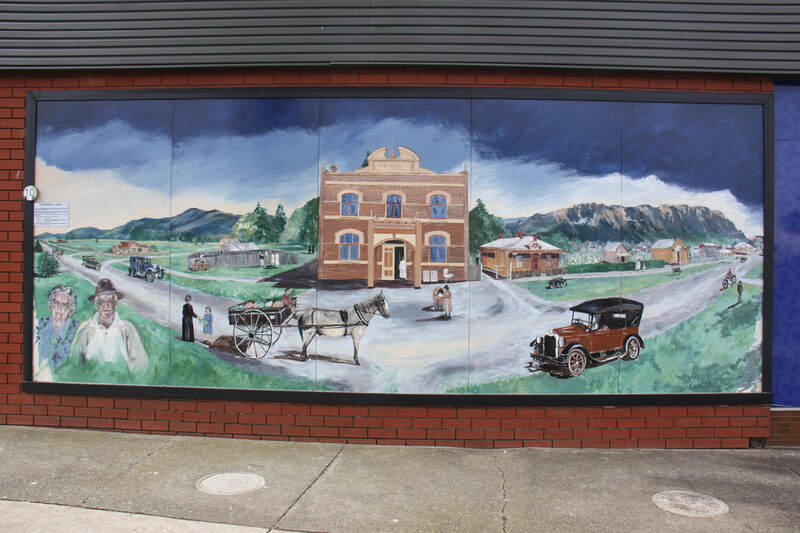 The first depicts a convict, supervised by a guard, constructing the bridge; the second shows significant events in the town's history, including a model of Harold Gatty and his aeroplane that circumnavigated the world in 8 days; whilst the third is local flora and fauna. We next crossed over to the east coast, driving first through sheep country, then through impressive eucalyptus forest before dropping down to the coast. From there we headed north along the Tasman Highway. 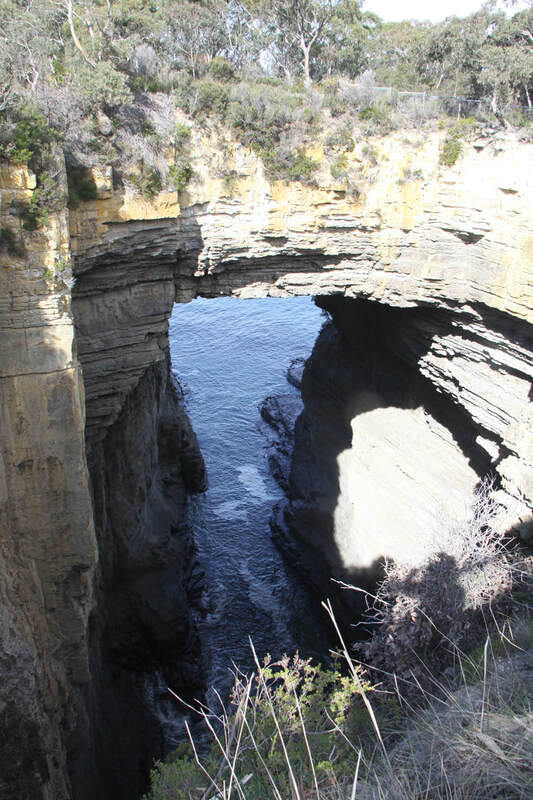 This was a beautiful route as for most of the time, the road hugs the coast with far reaching views to the Tasman Sea. 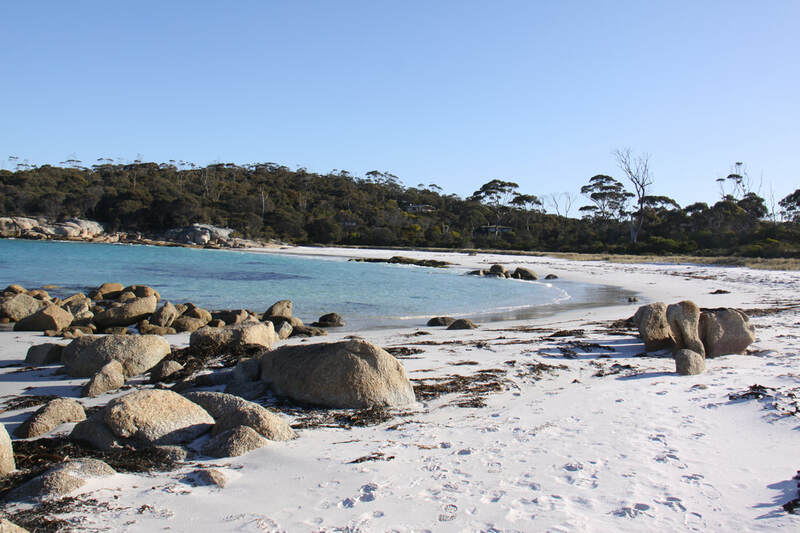 Our pitch for the night was overlooking the white sands and azure blue sea of the Bay of Fires, so named by the early explorers sailing along the coast and seeing the camp fires of the aborigines onshore. We awoke to a gloriously sunny morning. A long drive heading from the east coast back to the north of the island was in store for today but, what we hadn't known, prior to setting off, was how beautiful that drive would be. From the Bay of Fires, the Tasman Highway cuts inland and climbs through the forested hills of the northeast highlands. At times the steep, twisty, narrow road was quite treacherous as it wound its way through lush temperate rain forest. Around Blue Tier there was still evidence of tin mining which finished in the 1950s. Navigating through Launceston, Tasmania's second largest city, proved to be a nightmare - few road signs and the satnav directing us down the narrowest streets. In the end, we just followed the rest of the traffic in the hope that we would end up in the right place! Eventually we "escaped" the confines of the city and , remarkably, found ourselves on the correct road for our destination, the heritage town of Evandale. We spent the afternoon shopping and wandering the streets of Evandale. There were some lovely old shops and interesting statues, including one of a man with a penny farthing bicycle. Every year, the town hosts a penny farthing bicycle race! Overnight at the rest area beside Evandale Market Hall. 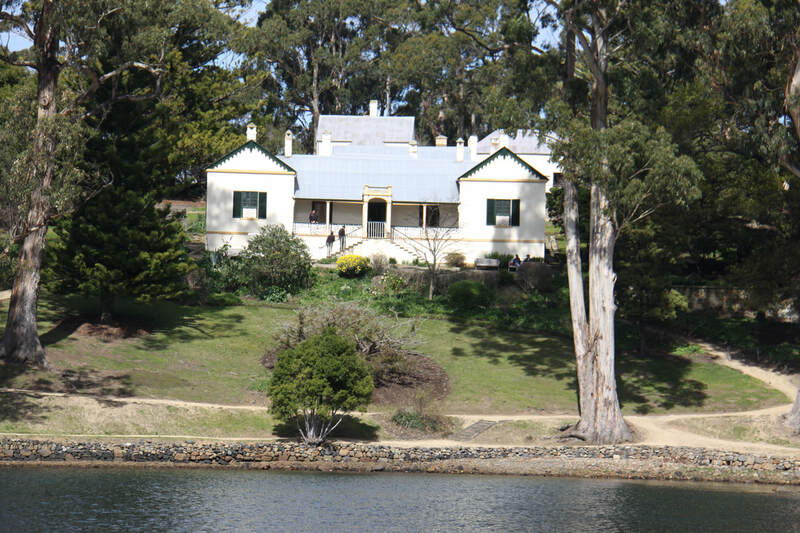 Today we visited the Woolmers Estate near Longford, one of the eleven sites included in the Australian Convicts World Heritage property listing. 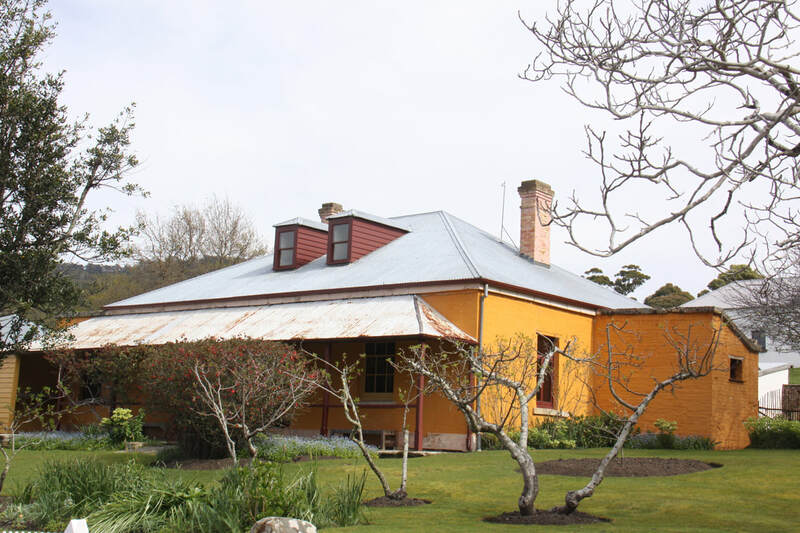 Established in 1817, Woolmers homestead and its outbuildings are virtually unchanged since the Archer family developed the estate, using convict labour, and as such it is a rare example of rural colonial settlement in Australia. The actual house is a story of two parts. The original house dates back to around 1820 and it is reminiscent of the "bungalows" built by the British in India, with a wide verandah to keep the house cool. 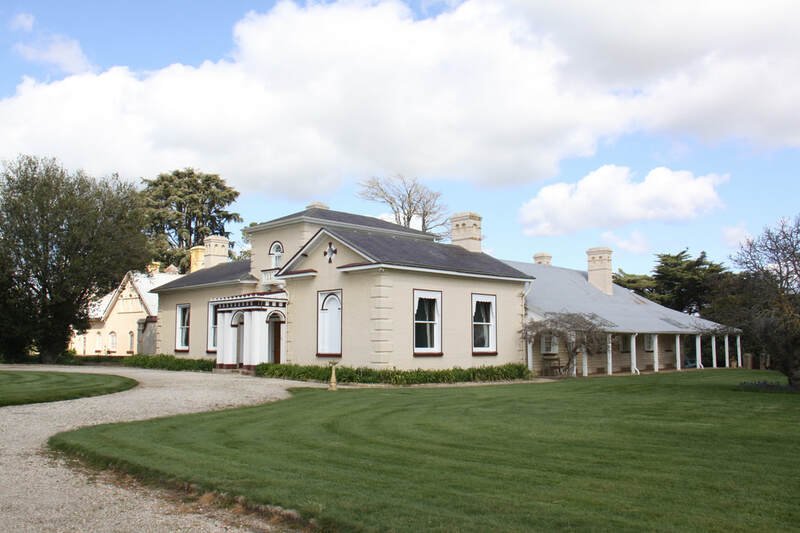 A new front in Italianate style adding extra rooms to the property was completed in 1838. These included a formal dining room and drawing room, in which to entertain guests. Despite the grandeur, there was no running water in the house and electricity was not installed until 1979. All the rooms remain furnished with original items, the finest of which were built to order and imported from England. All told, the property looks as though the last members of the Archer family have just walked out to stroll round the walled gardens. In the grounds are various outbuildings in various stages of renovation. These include very fine stables and coach house which contain a classic car collection, a huge wool shed and an Apple Store used to produce cider. Cottages used by farm workers are now available for rent as holiday lets. The National Rose Garden is now established in what were the property's formal gardens. From Woolmers we drove to the small town of Sheffield, passing en route through Railton with its many topiary creations scattered throughout the town. Sheffield has earned its fame as the "Town of Murals". More than eighty can be spotted when following the town's Mural Trail. We stopped here for the night at the town's RV park behind the sports ground. We took a real chance today and headed to Cradle Mountain despite a poor weather forecast and the mist being down over the mountains as we left early this morning. The problem was now or possibly never as tomorrow's forecast featured the word "snow" and maximum temperature of 4 deg C! The hour or so journey to Cradle Mountain was beautiful. The road zig-zagged ever upwards through temperate rain forest until we reached the high plateaus that gave us a taste of what was to come. 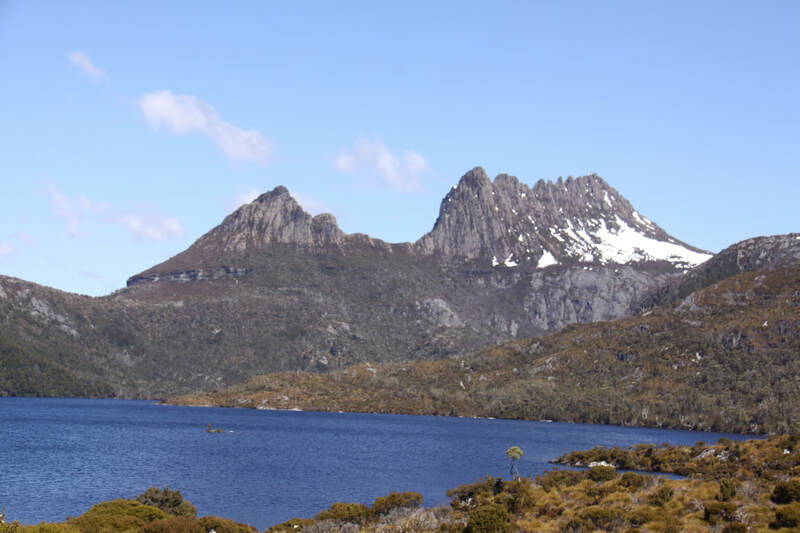 The Cradle Mountain - Lake St. Clair National Park entry fee includes a hop-on hop-off shuttle bus that runs at regular intervals between the Visitor Centre and Dove Lake, which nestles under the distinctive shaped Cradle Mountain. From the bus stop you have a choice of walks, long or short, level or steep. We opted to walk to Glacier Rock where there was a lovely view across the lake to the mountain and then along the lake shore to the boat house. 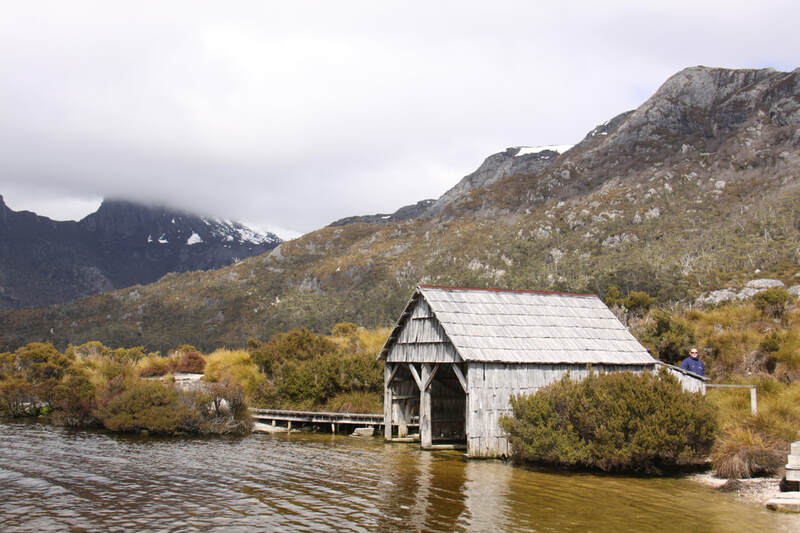 These two walks gave us a real feel for the area and in fact we returned to the lake later in the day as the clouds had lifted and we could now see the jagged peaks on the top of Cradle Mountain! We used the shuttle bus to get to the bottom of the steep track leading to the Waldheim Chalet. This is a reconstruction of the original chalet built in 1912 by Gustav Weindorfer, who designed it to look like the chalets in Austria where he was born. 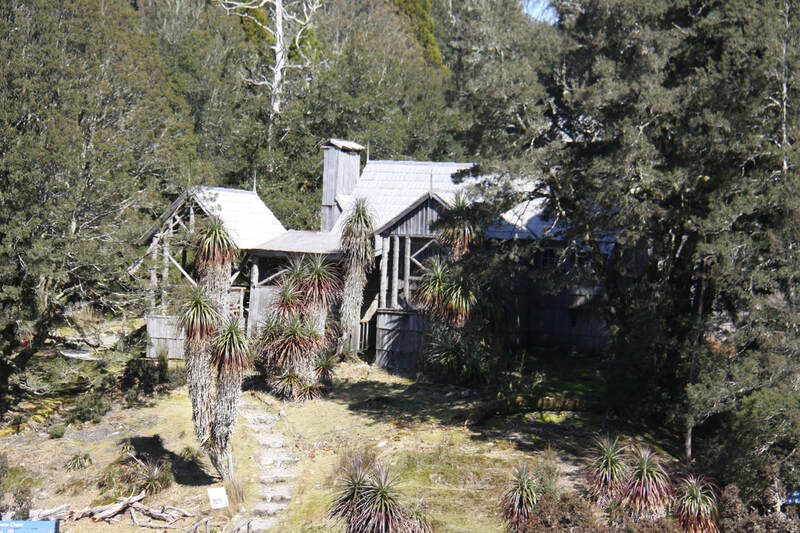 Gustav and his wife Kate were instrumental in getting Cradle Mountain recognised as a National Park. From the chalet we followed a broadwalk across a button grass shallow valley. 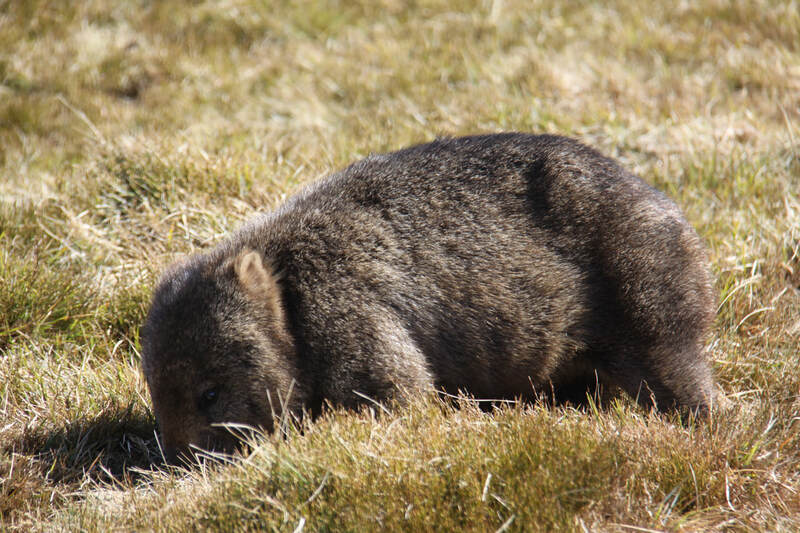 Along the path we were lucky to see a wombat at close quarters. We returned to Sheffield for the night having had a lovely day and even a warm day with some sunshine, surrounded by beautiful scenery. Thank goodness we had ignored the weather forecast. As it was a blustery day with a cold biting wind, we decided to stay one more night on the RV park at Sheffield. We had planned to spend our last night in Tasmania on the north coast but neither of us fancied spending the night on a cold windy coast. We spent the morning following the town trail and looking at the murals. Sue visited the hairdresser whilst I went to the garage to check on tyre pressures, oil level and fill up with diesel. We then had lunch in the local cafe. The afternoon was spent cleaning Nicolle inside. Hopefully when we reach Devonport tomorrow we will find a car wash and clean her outside. This morning we drove the short distance back to Devonport. 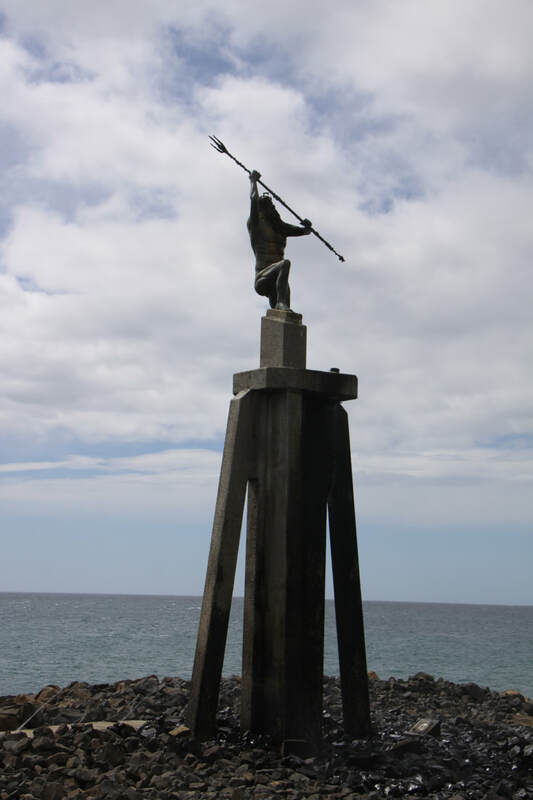 As we had plenty of time before we needed to head to East Devonport for the ferry, we headed to the Mersey Bluff to see the "Spirit of the Sea" statue - a striking symbolism of King Neptune. A short distance along from there was the lighthouse. After lunch we treated Nicolle to a much needed pink foam wash! Next stop was the launderette. We had along wait before boarding the "Spirit of Tasmania" for our return to Victoria. You are advised to be at the ferry terminal by 6.30pm, but today loading did not begin until 8.00pm! As soon as we had settled into our cabin we went to the restaurant and had an excellent "Captain's Buffet". "Farewell to the lovely Tasmania, Goodbye to the Mersey Bluff. We are bound for South Australia, By the way of the Great Ocean Road"